The first decision when buying a Range is to assess whether your home is fitted with Gas or Electric power. 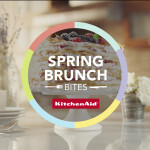 If you have the option to choose, you can make the decision based on your personal preference and cooking/baking habits. Electric –both the cooktop elements and the oven are heated using electric power. Gas only –both the burners and the oven are powered by gas energy. Dual Fuel – gas will fuel the burners and electricity will power the oven. Both power sources need to be installed in order to use Dual Fuel. Ranges with controls on the front panel have a premium, built-in look to fit seamlessly between your countertop. The controls are on the front and there is no back panel, which allows you to showcase your backsplash. The front controls also provide convenient access so you don’t have to reach over the cooktop. 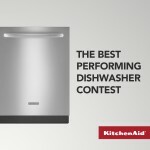 The sides of a Front-Control range are finished, so it offers the flexibility of even placing it at the end of a countertop run. It has an oven and cooktop. If you’re after a premium look, this style will likely appeal to you. Rear-Control ranges have a back panel and finished sides. This style is great for flexibility in placement as the range can fit between cabinets/countertop, at the end of a cabinet run or even stand alone. The oven and/or cooktop controls are located on the back panel. Rear-Control ranges can be found in all price points, from entry level to premium. Double-Oven ranges come in various oven sizes: smaller top oven paired with a larger one on the bottom, the opposite combination, or two same-sized ovens. 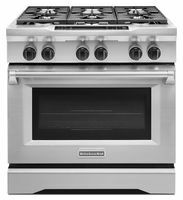 If you’re considering a double oven, think about what you often cook and bake, how often, and how many people you cook for. Based on these considerations, using a double- oven may mean that you use the smaller oven for most of your cooking/baking and the larger one for holiday feasts. The best part: these ranges let you bake cookies in one oven while cooking a roast in the other! Commercial Ranges bring the precision and versatility of a professional range to the home. 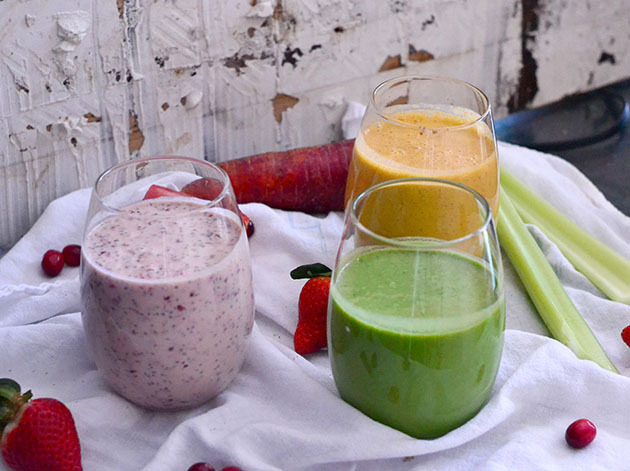 They get their name from resembling appliances you might find in a commercial kitchen. They are distinguished by their industrial look. They are only available in Gas or Dual Fuel. 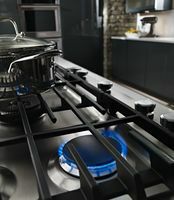 How many elements (Electric) /Burners (Gas) would you like on your Cooktop? Is power or flexibility important to you? The electric coil elements are a traditional stovetop design that offer an entry price point option. A ceramic electric cooktop has a smooth and sleek appearance. The flat surface will also allow for it to be easier to wipe clean than a coil cooktop. The heating elements will sit underneath the surface with built-in sensors to let you know if the areas are hot. Some options available include bridge elements and simmer elements. 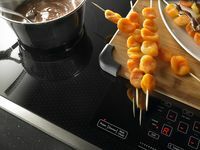 Induction Cooking uses electromagnetic energy to generate instant heat directly to your cookware without spreading the heat across the entire cooking surface. It is the most efficient cooking surface. Using the right types of pots and pans for induction is very important, as the quality of the pans will affect its ability to transfer heat. Note that not all pots are compatible for induction cooking. Since the pots are used to transfer heat, the rest of the cooktop is able to stay cool. Gas cooktops use an open flame to heat your pans. The gas functionality offers quick response times for precise cooking by adjusting the size of the flame. 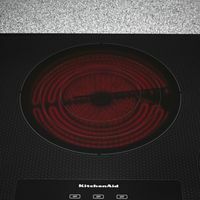 Additionally, gas cooktops do not require electricity so you can use them during power outages. Burner Options with cooktops include: heat output levels- BTUs (British Thermal Units), number of burners, extra griddles. 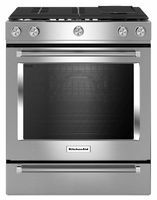 A conventional radiant oven has two heating elements—a bake element in the bottom and a broil element in the top. 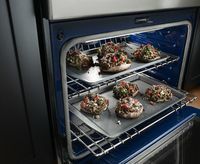 A convection oven adds a fan to move air continuously throughout the oven cavity. 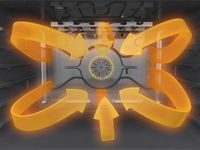 The fan helps to circulate the air, in and around the oven cavity to help provide consistent heating and even cooking. True-convection pairs a fan and an extra heating element that work together to help provide even temperature management. It uses a fan that draws air in, past the heating element and back around the oven. When buying a range, capacity is an important factor to consider. The capacity is the usable size of the oven cavity measured in cubic feet. 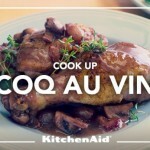 This allows you to estimate how much food can really fit inside the oven. As a general rule you can assume you will need 1 cubic foot per person in your family. For example, for 1-2 people a capacity of 2-3 cubic feet is likely appropriate, if your family has 3-4 people a capacity of 3-4 cubic feet is a good place to start. Manual Clean – Requires cleaning by hand. 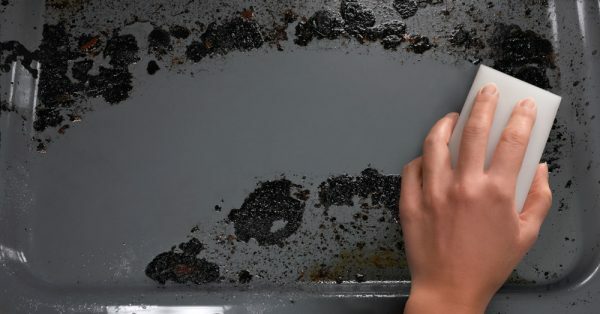 Regularly wiping down surfaces within the oven cavity with mild soap and warm water can prevent stuck on messes from becoming tough to remove over time. Traditional Self Clean – This is a high temperature self-cleaning cycle. It uses high heat to loosen and power through soils within the oven cavity. This makes it quick and easy to wipe down the oven at the end of the cycle after the oven has cooled completely. Aqualift® Self Cleaning Technology – Delivers odour-free oven cleaning in only 50 minutes. This cycle heats to only 200 degrees F and uses water to release baked-on foods from the bottom of the oven. When cycle is complete, soils and excess water can be easily removed with a sponge. 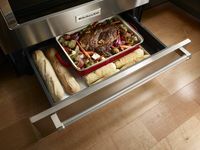 Storage Drawer: Allows for easy storage of pots and pans and frees up Countertop and Kitchen Cabinet space. Warming Drawer: Allows you to keep food warm until it’s ready to be served, especially if your whole meal isn’t finished at the same time. Baking Drawer: Adds more cooking options to the oven. The separate compartment allows you to slow cook or bake at a different temperature or keep dishes warm. When buying a Range it is important to consider the size of your Kitchen cut out. Measure your existing appliance or the space you need to fill. Also, look for installation instructions for the range you are interested in to ensure it will fit in the space you have. Range sizes have become standardized throughout the years in both height and width. The majority of freestanding ranges are designed to fit a 30″ wide opening. 36” widths are available but usually only in a commercial range format.